The evaluations below were proposed in 2002 by Jean-Pierre Girault, director of the archeological excavations at Loulié. Guy Maynard collaborated with Mr. Girault for the section on the presence of animals at the siege of Uxellodunum. The Gauls beaten on the Loire, near Saumur (?) or at the Ponts de Ce (? ), perished in large numbers: 12,000 according to Hirtius (8/29). About 2,000 to 5,000 (50) rallied to Drappes who intended to invade the province (VIII, 30). There is nothing to indicate that the army of Drappes consisted solely of fugitives from the army of Dumnacos. Indeed, the beginning of chapter (VIII, 30) mentions that since the beginning of the uprising, Drappes had already been associated with "people without confession, banished, slaves and thieves". The fugitives of the Dumnacos' army could have come to reinforce this troop. No text specifies the total number of personnel. When the Gauls went off to find provisions, only 2,000 men remained at the oppidum (8/34). If we consider that Drappes had 2000 to 5000 men, we can assume that Lucterios on his side had enlisted at least 500 to 1000 men. 2000 hommes in arms, remaining stationed within the enclosure of the oppidum. To this should be added certainly not a negligible number of oppidani (B.G. : VIII, 33). Indeed, the oppidum was a place of residence for a small number of people, serving as a refuge from the surrounding population. To this count, we must add men and women who could help in combat and other duties by throwing rocks or stones or by fighting directly. So the Gauls could have had 2700 fighters in the broad sense of the term. 500 to 4000 men in arms went off to search for provisions with Drappes and Lucterios. Caninius sent all the cavalry and the Germain infantrymen to the camp of Drappes. So it is not 500 soldiers who were parading in Quercy! Camille Jullian estimates (52) that "the Gallic chiefs brought 2,500 men to Uxellodunum". But they retained 2000 men there when they left to find supplies. They would have had only 500 men to guard the Drappes' camp and Lucterios' security convoys. J.-B. Cessac (53) says: "I believe that I am right in estimating at five or six thousand men the number of light troops going off foraging. Once these had left, after two fatal encounters, I can still estimate at ten or eleven thousand the permanent or accidental local population, among whom a third or a quarter took part with the garrison in the defence of Uxellodunum." Emile Albouy (54) estimated the number of combattants who entered Uxellodunum at about 5000 men. During the Gallic Wars, the Gallic forces (55) had no army, instead their forces were a grouping of contingents sent by different tribes and commanded by their own leaders. Within these contingents, the elite was was composed of the cavalry: Caesar called the Gallic nobles the equites (knight-riders), themselves fighting on horseback and surrounded by auxilliary riders. Caesar informs us that, in order to make up for the small stature of native horses, these nobles bought "at any price" foreign mounts. They wore helmets (paragnathids), coats of mail and carried shields. Their offensive weapons were the spear and the long sword. This cavalry, by its aristocratic character, enjoyed a high profile and excellent training. It was quite different from the infantry, recruited from rural workers during a campaign or expedition, and then sent back to their fields. They had no regular training, and often limited experience. The chiefs had to provide them with equipment and pay them a salary. They were armed with a javelin and a sword, but their defensive equipment is less well known, except for the large oblong shield almost the height of a man. Whatever their valor and physical qualities, the infantry could not compete with a well trained regular army. It is generally accepted that the theoretical strength of a legion is 4000 men. At the end of the season the numbers would be therefore lower, that is, about 3000 men (56). This makes a total of approximately 21,000 men. To these figures must be added the cavalry (VIII, 28, VIII, 36, VIII, 39), Caninius' infantry or those employed as auxiliary troops (VIII, 36), the Cretan archers, and the Balearic slingers (VIII, 40). The assessment of all the troops besieging Uxellodunum would be around 30,000 combatants. But, in order to evaluate the real numbers of the "expeditionary force", it is necessary to double this figure, to take account of the attendants of all kinds: slaves (57) (VII, 89), and "valets" taking care of luggage, beasts of burden carrying luggage or pulling the war machines. 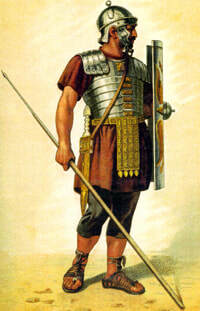 According to Alain Deyber (58), the Caesarean Exercitus employed a large number of auxiliaries, that is to say non-legionary contingents composed of soldiers who were not Roman citizens, mostly from the western basin of the Mediterranean: Cretan archers, Balearic and possibly Numidian rebels, cavalry and light infantry composed of Numidians and Germans. 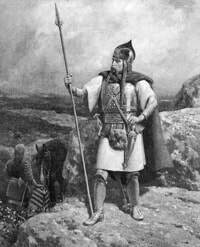 There were also Gauls committed to a particular campaign or to accomplish a well-defined mission: one thinks of the many guides, scouts, interpreters, couriers and messengers which were vital to the army operating in a hostile environment. The only motivation of these professional troops was "the hope of loot". These more or less organised formations were commanded by their traditional chiefs, dressed and equipped according to their national fashion. They generally observed the tactics of their employers in the actual engagement. They had to have at least the rudiments in order not to go against the flow and to cause a manoeuvre to fail, but they fought none the less according to their own techniques and with their personal weapons. Legionnaires made up the heavy infantry. They wore a very simple helmet, a coat of mail and carried an oval shield. Their offensive weapons are the javelin (pilum), and a sword or a dagger for man to man fighting. The legion had its own artillery, various machines for throwing stones (ballista) or metal projectiles (catapult bolts). It also included specialists of genius, and the legionnaire could transform himself into a builder, a carpenter, a lumberjack or even a manufacturer of weapons! When the Roman army was on campaign, it was necessary each evening to establish and fortify a camp. At other times the legionnaire could be sent to the fields to cut wheat or to forage. The legion was divided into ten cohorts, each comprising six centuries. At the head of each century was the "basic" non-commissioned officer: the centurion, who, broken out of line, could advance to the command of the cohort, and, for the best of them (the "Primipiles"), could attend staff meetings. Among the officers, we distinguish the tribunes, from the equestrian class, normally assigned to the supervision of the legion, the prefects exercising administrative tasks and - very exceptionally - the command of the fleet or cavalry. Finally, the legates - from the senatorial class - were direct collaborators of the proconsul who gave them any task, whether administrative (for example to maintain order in a region) or military. The Roman army was therefore structured, trained and experienced. At the end of the Gallic Wars, the Roman army consisted of 12 legions, therefore more than half of the legions were at Uxellodunum. Due to their different methods of recruitment and their habits, Gallic infantrymen and Romans could not attain the same speeds of displacement during a campaign, although antiquity was certainly based on a pedestrianised civilisation. The theoretical displacement capacity of a pedestrian carrying a load of 30 to 35 kg on the back was 30 or 45 km in a day. But it is necessary to distinguish the theoretical capacity, that is, the distance that can be achieved by a pedestrian free in his movements, from that of a pedestrian slowed down by his baggage (impedimenta). According to Goudineau (59): "In Caesar's army, in theory, movement by road was regulated: the normal daily distance should not exceed 15 km, double that in the case of an emergency and the 30 km was completed normally in five hours in good conditions, Caesar made his troops do more, and he himself often paid particular attention to his speed and that of his army, which allowed him to surprise his opponents more than once." According to the Universal History of the Armies (60): "The Legionaries generally moved in maniples - supple infantry units organised in a column of 12 files and 10 ranks. Sometimes, if the ground permitted, they walked in parallel columns so as to be always ready for combat. A legionary army always moved with a vanguard and a rearguard of horsemen and auxiliaries. The large force consisted of the legions, with their baggage following immediately behind them. The daily leg was 24 kilometers (six leagues). In the case of an emergency the legionaries carried less weight and covered between 30 and 40 kilometers in a day. The legionary moved with all his weapons and other equipment (such as bowls and tent part) and carried up to 15 daily rations of food, 850 grams of wheat, 150 grams of bacon, 20 grams of cheese and a little vinegar. In total, each day, up to 40 kg of baggage." Cicero (61) gives us an explicit text concerning the soldier's kit: "You see the pain, the fatigue in his movements (...) The soldier must carry food for more than fifteen days, carry all that; the helmet, the shield, the sword, our soldiers do not count them as any different from their shoulders, their arms, their hands - do not they say that their weapons are the soldier's limbs? " Legionaries were professionals subject to strict rules. The Gauls in arms remained a motley gathering of militiamen whose indiscipline and personal quarrels obviated the effectiveness they could inherently demonstrate. Their planned displacement, without urgent circumstantial constraints such as a hasty retreat before an enemy superior in number, was therefore chaotic. Drappes project to go down to the south to ravage the province was like any long journey that required consistent organisation. The fact that after several days of travel, the Gauls of Drappes and Lucterios considered taking refuge in an oppidum shows that Caninius' troops speed of progression was superior. Of course, the more disciplined legionaries had to walk for a significant number of hours, but the transport of baggage by pack animals rather than ox-drawn wagons represented their main advantage in speed of movement. In addition, the presence of many slaves would have relieved the burden of the Roman soldier. This explains why the Gauls, feeling closed in, had to take refuge in an oppidum. Every day saw the distance between the two armies diminish. Thus the contingents of exploration and protection (riders, in principle) at the ends of each column could be mutually observed as soon as they entered the land of the Lemovices. The Gallic leaders had to draw the consequences. Taking account of possible losses during the preceding campaign, the army of Caninius included around 12000 pedestrians, that is 6000 infantrymen plus the usual accompaniment of specialised workers, slaves, etc., plus 500 riders, 2000 to 2500 pack animals (mares). Carts carried dismantled artillery and various materials such as forges, tools, hand mills, etc. The whole could extend to 15 km in length. 30 x 10m = 300 m. By including safety intervals between the various categories, the column could occupy, provided this formation is respected, a linear space of 800 to 900 m.
The cavalry, estimated at 500 units, occupies a space of 750 to 1500 m according to the width of the path (one rank or two ranks of a troop of riders). Thus the small army of Drappes and Lucterios could, given the estimated personnel, stretch up to 2 to 3 km for 2000 men, or 4.5 km to 6 km for 5000 fighters. The presence not mentioned in the texts, but conceivable, of women (10%) and "civilians" (20%) could have increased this length by 30%. Armies, according to their importance and in order to avoid the dangers and inconveniences of overstretched columns, were often forced to move on a wider front. The Marshal of Puysegur (65) notes: "The great armies are obliged to march in a large number of columns, otherwise they would not advance and they hold, when marching, 4 or 5 leagues of extension". If the oxen were forced to perform a prolonged displacement, the resulting exhaustion could be compensated for by daily replacement of animals. The most exhausted animals were destined for butchery. The cattle therefore provided energy and food. These animals were native, bought, requisitioned or supplied to the troop by their owner. Goats and sheep moving with the columns and led by shepherds have a travelling speed such that, not counting breaks intended for grazing, these animals are capable of long journeys at a sustained rate, similar to that of a practised pedestrian. A horse with his rider can travel 50 km per day minimum (9km/h) maximum 80 km. The evaluation of this performance applies to a rider plus his equipment of a total weight of 80 kg. This capacity can be significantly affected by the relief and the size of the load. A cart drawn by oxen can travel daily 2.5 km per hour x 10 = 25 km. As for a horse, the capacity of oxen pulling carts depends on a number of factors. The state of the road, the relief, the size of the load and excessive fatigue can each slow progress appreciably. Up to now, the question of the presence of animals has been missing from the Uxellodunum case file. However, animals represent an important element, as much by the potential food that they constitute as by the place that they occupied. Two groups of animals are to be taken into account: those who accompanied the Gallic army, and those of the local populations taking refuge in the oppidum. The site had to be large enough to welcome them and offer pasture all year long, which is the case for the Puy d'Issolud. To support future developments on this important topic, the lowest logically consistent estimate has been used. For its baggage and food supplies, the Gallic army used carts drawn by oxen. Horses and mules could also carry some of what was necessary for the subsistence of the soldiers. Based on the estimates of numbers, 1,000 horses were present, along with 400 to 500 oxen and 100 mules. 200 to 300 sheep or pigs were the reserve and the daily supply of food. 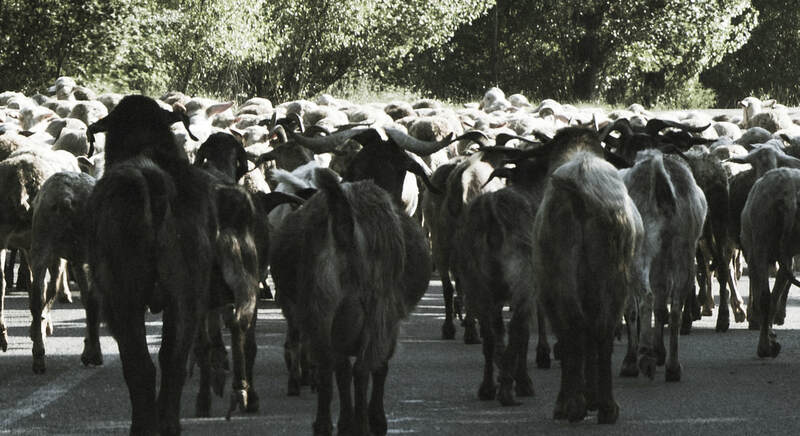 At the approach of the Romans, the surrounding Cadurques had to take all their herds to safety. The perspective of the siege was to extend fear to the distant neighborhood. Everyone knew the Romans' practice of requisition, a euphemism for controlled looting, which allowed the occupying army to stock up. No text informs us whether other oppida in the region moved their animals in order to protect their property (66). The animals accommodated on Uxellodunum must have numbered at least 500 oxen, 200 sheep brought down from higher ground, 100 goats and as many pigs, about 50 horses and some mules. To this flock would be added the animals transported by the insurgents. The total number of animals could be at least 600 oxen, 500 sheep, 100 pigs, 100 goats and 50 horses. The apparent distortion between the total number of cattle present at the time of the arrival of the Gallic army and the number retained for the siege is due to the fact that carts were used to collect wheat. Therefore oxen and other beasts of burden (horses or pack mules), were required for pulling carts or carrying loads. Puy d'Issolud intrinsically represents a grazing capacity that, in a period of military takeover of the site, is difficult to assess. Although the oppidum was sparsely inhabited, permanent residents would have cultivated favorable areas, such as the Black Combe. Between the fortifications, houses and maintenance buildings and cultivated areas, it is estimated that the grazing areas amounted to 40% of the surface of the plateau, that is, about 30 hectares. On the other hand, the practice of feeding cattle with branches of trees during the periods when hay was lacking must be discounted: the flanks of the oppida, for obvious military reasons, were cleared of their plant cover. How many trees remained on the plateau itself? Construction and restoration of the houses would logically use trees felled in the neighbourhood, and low branches and sheaves would have been collected daily to feed the fireplaces. The Gallic oxen were notoriously smaller than Roman oxen which were closer to the size of contemporary cattle. In fact the Gallic cattle were 25% smaller than their transalpine counterparts. Their muscular capacity was commensurate with their size. The wagons had either to carry lesser loads, or be coupled with two or three pairs of oxen, especially because the weight of the vehicle with its solid wheels represented a handicap. These rations represent a "normal" amount, an average, which would allow the animal, if not to prosper, at least to maintain the same level of weight, and the same physical state in order to provide the customary traction capacity. The fact that animals were concentrated in enclosures can have an impact on water consumption: it is reduced if animals do not move far and are sheltered from the sun; it is increased if they are exposed to great heat. Displacement required more copious watering, even more so during the heat of summer. A man consumed at least 2 litres of water per day for drinking and for cooking. The ration for each man was set to 750 g of flour per day: therefore, for 1000 men, the total was 750 kg of flour. To that must be added the meat, cheese and oil that the Roman legionnaire prepared himself (because there was no cook). The weight of the ration comes to 1 kg per person per day (Goudineau, 1992, p 242). But the wheat reserve in the convoy must be included because the safety margin had to include at least one week's supply of food (1600 mules loaded at 75 kg each). According to Eric Muraise (Introduction to Military History, pp. 190-191): "The legionnaire in the first century BC carried seventeen days supply of wheat and the legion's convoy added thirty days supply. In the case of war, the ration was halved to 0.5 kg for the men, and 6 kg for the horses (instead of 12 kg). The maximum convoy for a legion of 3900 men, represents 115 tones of food and luggage covering 30 days. " A Gallic ox could feed 400 people given its weight and the norms of the army. But the Gauls were considered the biggest meat eaters of the ancient world. An ox will therefore be considered here as feeding 300 people for one day. After 15 days of siege (? ), the oxen would have the most difficulty surviving a scarcity of fodder, and would have been sacrificed. But this slaughter does not imply an immediate consumption of the meat. Because of the large amount of water needed for the animals, the slaughter of oxen rapidly became necessary. However, the meat could be preserved by salting, a technique mastered by the Gauls, or smoking. After about 30 days, sheep and goats would be slaughtered in their turn. These animals, similar in size, can provide 60 rations per day. The number of animals to be slaughtered would be 70 (taking into account the possible human losses). Given the estimated number of 600 sheep and goats, we obtain 8 days supply of meat. That leaves the pig herd. An antique pig, smaller than modern day products of selective breeding, could provide 80 rations per day, or just over one day of rations. Note, however, that this order of slaughter is only a logical extrapolation of the animals' ability to survive the difficult conditions: sheep, goats and pigs demand less water and they are content with poorer food. Goats perform acrobatics to climb steep ground in order to reach the slightest green shoot. In short, the oxen, reputed to be less rustic, had to be the first to be sacrificed. The total herd thus represents 44 days of meat supply, in theory, without any reduction in the customarily large Gallic rations. But the prospect of food shortages must have encouraged the chiefs to reduce the daily meat ration, perhaps by a third, which would increase the meat supply to 58 days. A man consumes at least 2 litres of water per day, for drinking and for cooking. 4500 x 2 = 9000 liters of water. This ration can be reduced by half a litre, which reduces the minimum quantity of 2250 litres. At the beginning of the siege, the animals' water consumption could amount to 10,600 litres of water. The animals could be driven to several watering places, streams and springs, since circumvallation work had only just begun. Once the enclosure became more and more complete, access to various water supply points would have been reduced to the Loulié spring. The water requirements at the end of the siege therefore in hteory represented 9,000 + 10,600 = 19,600 litres with a minimum of 17,350 litres. The part of the animals consumed daily. The share of the individuals killed in combat, estimated at 300 people, that is to say 600 litres. 10 m3. Goatskin gourds contain about 15 litres of water. By maintaining the same consumption, this corresponds to 700 units. The Commentaries indicate that, initially, the besieged benefitted from several water supply points. In particular, it is said that, due to the fact that the circumvallation had not been completed, it was still possible to access the river. This crucial issue of water is therefore closely linked to the progress of the siege works. Caesar's final adventures, while representing the deus ex machina that ends the conflict, represent only a part of the military operations, concentrated into a small number of days. On the contrary, the construction of palisades and ditches to hermetically enclose the insurgents represents a long-term activity since it seems to have lasted at least thirty days. Where does a military commander decide to start constructing a circumvallation? Where these works would be militarily the most effective while being feasible, on condition that the workers or soldiers are safe from a deadly counter-attack. The notion of efficiency applies first to the establishment of fortified camps, positions of support and observation posts. The besieger next devotes himself to interrupting the main means of communication: roads that can take wheeled vehicles. Finally joining up, little by little, the works already realised, the project manager will ensure the definitive closure of the whole. It is obvious that the time taken to construct a circumvallation is a function of the size of the oppidum to be enclosed, the availability of materials and the ease of moving these materials. Whatever the source and the location of Uxellodunum, the harassment of the Romans made access to the spring perilous. Fetching water at dawn and dusk would have provided better security. The chore, which was divided into two sessions, however, represented 700 passages on the access path, a continuous file of water carriers. Arrangements to protect the files from Roman fire seem essential. These arrangements could have been walls and palisades, or sections of walls and palisades behind which the labourers could shelter, then exit unexpectedly, run to the next place of shelter, and finally accomplish their mission: fill their gourd, or hand it over to the besieged in charge of distributing the water. If such a protective constrcution had not been put in place, access to the source would have been severely disrupted by fire from the Roman assault tower. Of course, significantly reducing the water supply also reduced the length of the siege. But it was necessary to resort to capturing the water of the spring, so to a cunning plan, to prevent access to the essential liquid. This proves that the Gauls in charge of fetching water could access the spring, bearing risks of course, but minimal risks. The inverse would have quickly put an end to the siege.